Like the Apple TV, a Roku can also stream movies, television shows, and music stored on your Mac. (Except for any movies or television shows downloaded from iTunes - see the note below.) All of the DVDs you've ripped, (see How to Rip DVDs with Handbrake), movies you've downloaded, and music you've purchased on your Mac can be accessed by your Roku and viewed on your television. All you need is a free application called Plex. Note: Plex does not work with movies or television shows purchased or rented from the iTunes Store. Those files are protected with DRM (digital rights management). If you primarily download movies from iTunes, you'll probably want to consider purchasing an Apple TV. 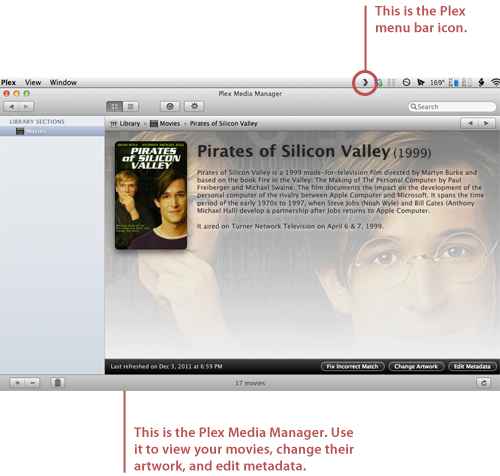 Download Plex from the Plex for Mac website. It's free! Open the Plex application. (We also recommend that you move Plex to your Applications folder.) The window shown below appears. 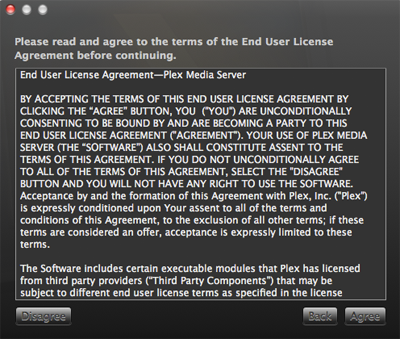 Read the license agreement, and then click Next. The window shown below appears. Now you need to tell Plex where your movies are located. 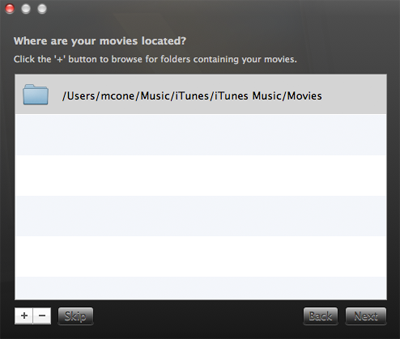 If you've added them to iTunes, you can specify the iTunes Movies folder, which is by default located at /users/your_username/Music/iTunes/iTunes_Music/Movies, where your_username is your account on OS X. Click the + button to add a new directory - you can specify more than one source directory. Click Next. The window shown below appears. 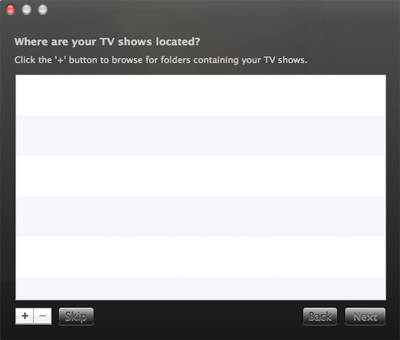 Optional: If you have any television shows, now is the time tell Plex where they're located. Click the + button to add a new directory - you can specify more than one source directory. Optional: Plex is also capable of streaming music from your Mac to the sound system connected to your Roku. If this is something you'd like to do, now is the time tell Plex where your music is located. (The default iTunes directory is /users/your_username/Music/iTunes/iTunes_Music, where your_username.) Click the + button to add a new directory - you can specify more than one source directory. 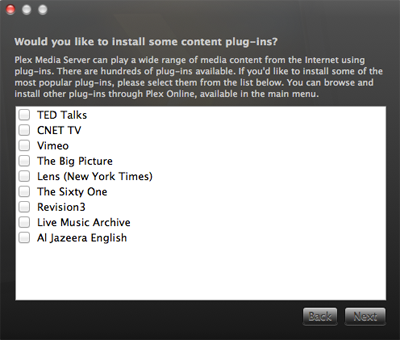 Optional: Plex can install content plug-ins to connect you with other video content available on the Internet. Most of these plug-ins already have channels on Roku, so there's probably nothing here you need to select right now, unless you want to watch this content on your Mac. 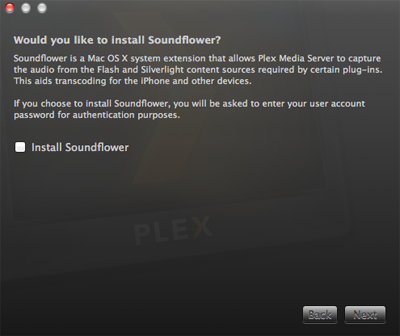 Optional: Plex can install something called Soundflower. We do not recommend that you install this. Plex is (finally) installed. 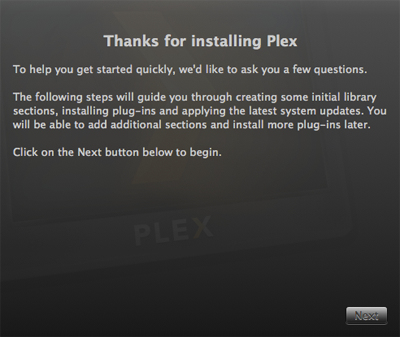 Click Start Plex for Mac to start the Plex server. It might take a couple minutes for Plex to start. From the Plex menu, select Media Manager from the Plex menu. The window show below appears. Verify that the Plex Media Manager contains all of your movies, television shows, and music. If something's missing, you'll need to find where it's located on your computer. Click the + button in the lower-left corner to add another source directory. In the next section, you'll learn how to configure Plex to automatically detect new media that you add to your libraries. From the Plex menu, select Preferences. Click Library. The window shown below appears. 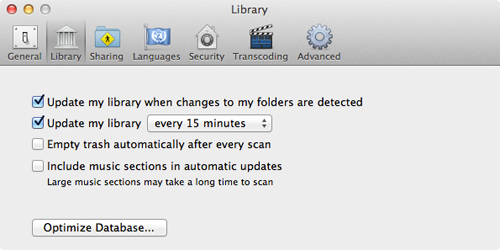 Select the Update my library when changes to my folder are detected checkbox. Select the Update my library checkbox. Select a time interval from the drop-down menu. Close the Plex preferences window. 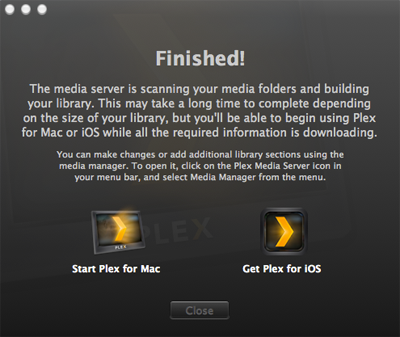 Now Plex will be able to find the new movies, television shows, and music you download to your Mac. Open your web browser to the Roku Account Login website. If you do not have an account on the Roku website, create one now. If you already have an existing account, sign in now. Click Add a Private Channel. The Add Channel web page appears. Enter plex in to the text field (make sure all of the letters are lowercase), and then click Add Channel. Log out of Roku's website. On the Roku, open the Channel Store and then close it. 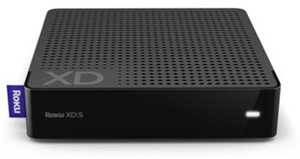 The Plex channel will be installed on your Roku's home page. Now the Plex application is installed on your Roku. On the Roku, open the Plex Channel.. Select Discover servers. 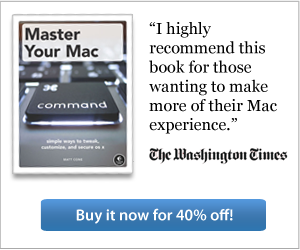 The Roku should automatically detect and connect to your Mac. Select the highest quality available to ensure that your movies look halfway decent on your television. Just remember, this solution won't work for any of the movies or television shows you've downloaded from iTunes. If most of your videos were purchased from iTunes, you should consider purchasing an Apple TV.